20th Century Fox, widescreen 2.35:1, languages: English DD 5.1 [CC] & Dolby Surround, subtitles: English, Spanish, single side-dual layer, 26 chapters, rated R, 100 min., $34.98, street date 9/21/99. Directed by Antonia Bird. Starring Guy Pearce, Robert Carlyle, Jeremy Davies, Jeffrey Jones, David Arquette, Stephen Spinella. It’s a recipe for nonstop action and excitement when the inhabitants of an isolated military outpost go up against a marauding band of cannibals in a deadly struggle for survival! Of the thousands films I have seen only 2 movies have had my opinion drastically change of them upon a second viewing. I am of course not counting movies where I had to watch them a zillion times to appreciate them or watched them again when I was more mature or only appreciated them slightly more. I'm talking where I saw a movie once, hated it, but on a second viewing within the same week caused me to just fall in love with the film. Brazil was the first where that happened. I first saw it and just thought of it as pretentious crap! Upon a second viewing, I basically loved it, seeing it as a classic. And after viewing the director's cut on the Criterion DVD it is definitely one of those films that would go on my list of the 10 best. The next film would be Ravenous. I first saw it and basically screamed "What the f*&% was that!?" I thought it was one of the worst films I had ever seen. But somehow curiosity bested me and I actually ended up buying it on DVD (hey! A rare Fox "Special Edition" for $20! Why not!?). I watched it again and couldn't believe how wrong I was. Man, this thing was one of the better films of 1999. Maybe it wouldn't fall in the top 10, but I'm sure it could weasel itself in at number 12. Maybe 11 on a good day. That's still saying a lot considering all the films that came out last year (of course, how many were actually good?). I'm not saying this is a classic, far from it, but it is a very original, very entertaining and extremely well crafted movie. It's a Period/Cannibal/War/Thriller/Horror/Dark Comedy film with a lot of class and style. It's also the best damn Period/Cannibal/War/Thriller/Horror/Dark Comedy out there! Also, the only one. Guy Pearce plays Boyd, an officer during the Mexican war who single handedly took control of an entire enemy fort. He is commended but his higher-ranking commander (John Spencer) knows that what happened (a neat little sub-plot I won't spoil) was an accident and that Boyd is nothing but a coward. He ends up relocating him to a fort in the middle of California, along the mountains. The fort is commanded by Hart (Jeffrey Jones) and contains some interesting characters including an off-his-rocker cook named Cleaves (David Arquette) and a quiet priest named Toffler (Jeremy Davies). You also get a soldier who is probably too tough for his own good and a drunken doctor. During the first while of his stay a stranger named Colqhoun (Robert Carlyle, appearing in more movies lately than episodes of his Scottish TV show from a few years ago) appears. He has a horrible story to share about a group of settlers lost in the mountains who had resorted to murder and cannibalism. This is when the movie gets good and offers some great twists. The movie is extremely gory to say in the least (you may not want to eat meat for a while after this) but at the same time doesn't overdo it. It's stylish and smart and executed very well by its director, Antonia Bird of all people (responsible for the very different films Priest and the sappy/bad Mad Love), an obvious vegetarian. Her best scenes all contain people eating or lingering over meat. Most of it quite disgusting. The insistence of authenticity also helps the movie. The sets and costumes fit the time period perfectly. I haven't seen many period pieces that look as authentic as this one does. Its mixing of war, the super natural, cannibalism and dark humor is first rate. No one else I believe could have handled such a vast mix of genres and come out with as good an effect. The writing is also first rate, offering many memorable scenes, lines and characters. The best scene involves Jeremy Davies screaming out "he was licking me!" The story flows smoothly and manages to mix into the genres one at a time perfectly. The movie has so much in it that shouldn't work so the skill in mixing them together for one film definitely has to be first rate. When you start out as a war movie then go into a cannibalism movie and then a supernatural movie, you have to be very careful not to make it too hokey. The score by Michael Nyman and Damon Albarn also works, even though it has nothing to do with the movie. Its very soft and easy to listen to. It works mostly because it doesn't go with the movie. From the twanging guitar to the happy search party music and then the hillbilly-like chase music this is definitely one of the better scores to appear in a film in recent memory. Unfortunately because of the fact the movie was highly overlooked it will definitely be overlooked for Oscars (as I write this, the nominations have not been announced). The acting is also wonderful. This may have hurt Guy Pearce's career. All he has is LA Confidential really under his belt so taking a risky role like this is, well, very risky! But he's still very good! His character is actually quite a complex one as his character is always torn between many different things. This also makes the ending more effective, and if you do look more closely, that is a happy ending! (It could not have ended any other way.) Robert Carlyle steals the movie as the villain. He doesn't play him over the top or as a cartoon. He's very serious but still offers some of the funnier moments in the film, like a scene where he gets stuck in a bear trap. And all the other performances are perfect. Other than Arquettes slight over-doing it, everyone finds a certain level to their character and sticks to it. I think this movie contains one of the better collections of performances than a lot of other movies. Even a Robert Altman one! I can't understand why I hated it so much during my first viewing. Now I consider it one of the better, more fun thrillers out there. I think about my reaction to it then and can't quite place it. It could be because that the movie really has so much that will appeal to so few. War movies are okay but not many Civil War-like movies appeal to many (I know this isn't the Civil War but it has the same feel as one). Dark Comedies aren't everyone's cup of tea, I know. And unless it has Anthony Hopkins in it, a cannibal movie is less appealing. Mix in the whole Vampire bit and you have a movie that would appeal to virtually no one. That would also have to do with why it bombed (plus Fox didn't know how to advertise it). I think all these things probably just didn't do it for me and I missed out on everything else the movie had to offer. That's probably weak but it's the only theory I can come up with right now. Fox obviously saw the potential in their odd film as they decided to give it a full-blown special edition! Fox mystifies me, I will admit. When they first start releasing movies they give us basic editions, maybe a commentary here and there or a re-hash of a laserdisc (Strange Days and Young Frankenstein come to mind). Then they're making 2-disc set after 2-disc set. This one is only a single-disc package but is the first (that I know of) special edition they have done for a film specifically on DVD. And they picked an odd one, too to make their big debut with (sorry, I don't count The X-Files). The film is presented in its original aspect ratio of 2.35:1 on this single-sided, dual-layered disc. Unfortunately Fox has not gotten into the habit of enhancing their films for widescreen TVs at this time. The picture is quite good, though far from perfect. The first thing I noticed is not a single print flaw. Not one! The picture stays sharp, even on long bright shots over a winter landscape. The colors are dirty but they are well saturated and do not smear. Blacks and shadows are perfect, making for very good night scenes. Flesh tones are a little off in some scenes I noticed, sometimes a little too pink but this could be how it was supposed to look, considering that being in the cold can do that too you. One major problem is when people are walking across the winter landscapes. The scenes are so bright that the objects in front of the snow give off auras or halo effects. There are a few jagged edges in bright scenes or dark scenes where a fire is nearby. Still this is a very terrific transfer. Less impressive is the Dolby Digital 5.1 Surround track. Most of the sounds come from the front channels and they work very well. Panning across the front, when called for, is dead-on accurate and loud. Dialogue is very intelligible and harshness in any way never occurs. Sound effects also come off crystal clear, from crunching snow to peeling skin. Unfortunately the surrounds are never used except for ambience. Sometimes music creeps back there but nothing else ever happens. Not even gunshots! I was surprised because even though the movie really isn't that noisy, gunshots could have zoomed by and the music (as cool as it is) should have worked back there as well. And when we do get surrounds, the back speakers work together. I didn't notice any "stereo" effect going on back there. But Fox has loaded in some supplements! A studio that never really did it now goes all out! You get 3 (yes! 3) audio commentaries. While they all aren't too enthralling, they each offer some good notes and stories. The first one has Antonia Bird and composer Damon Albarn. This one is the driest I think, but she explains nicely what she was trying to do and talks about working with the people involved and so on. She takes up most of the time, Albarn getting in a few interesting things. The second is the best one. It has Jeffrey Jones and writer Ted Griffin and is actually the liveliest of the three. These two seem to get along nicely with each other and give off a few good jokes. The third has Robert Carlyle. While all the others had their share of dead spots (although the Jones/Griffin one barely did) this one is basically a dead spot. Carlyle sounds nervous and unsure what to do, and I don't blame him. The others get a partner and he's alone. His commentary doesn't start until his character appears (which I think is chapter 4). He explains how he saw the character and some of the touches he tried to add and point out his improvised bit (I'd be proud of some of them, too). When he does talk it is somewhat interesting, though very hard to understand (he does have a thick accent). It's not too bad but I think he only talks maybe at most 30 minutes out of 100 minutes. You also get a collection of deleted scenes. I'm unsure as to where they are cut exactly but you get about 5 or 6 of them. They are all interesting and aren't "crappy" deleted scenes but they would not have served any real purpose for the film. Most of it is expansions of the Pearce character (including a scene where he admits to Jones why he was transferred to that post) but they are still covered in the film itself. You also get the option of a commentary by Bird to go along. You then get a bunch of photo galleries. One contains movie stills, which to be honest I don't understand, but they are good photographs nonetheless. You also get a costume design gallery giving hand drawings and photos. And then a set design gallery. I'm amazed at the stuff Fox went out to include with this disc. There is also an Easter Egg. Just play with the arrows on the remote until you see your cursor turn into a knife and fork. Hit Select/Enter and you are taken to a screen outlining the trail of the Donner party. At least how far they made it. You also get the standard theatrical trailer (which is not the same as the one I saw in the theaters) and TV spots. None of these seem sure as to how to advertise the movie. And there you have it. Will everyone like it? No. I can recommend a rental but a purchase is questionable. I found it worthy enough to purchase and am glad to have it in my collection. People who know and like the movie, this DVD is the way to go. Fox does a credible job on it and is well worth a purchase. Official Site--"No humans were harmed, tested or tasted in the making of this website. All recipes are fictious. Twentieth Century Fox does not condone cannibalism." 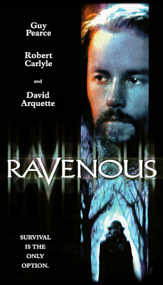 James Berardinelli's ReelViews--"The disappointing second half of Ravenous makes it difficult to recall the worthwhile aspects of the film's early portion." Roger Ebert--"The film's setup is more fun than its pay-off because in a story of this nature, we would rather dread what is going to happen than see it." Amazon.com--Available to purchase are the DVD at special discount and the original score soundtrack composed by Michael Nyman and Damon Albarn.